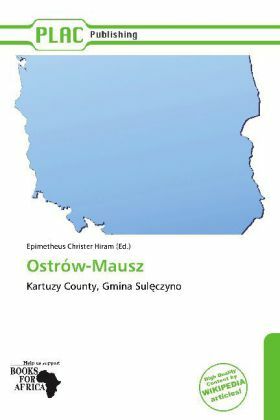 Ostrów-Mausz is a village in the administrative district of Gmina Sul czyno, within Kartuzy County, Pomeranian Voivodeship, in northern Poland. It lies approximately 5 kilometres (3 mi) south-west of Sul czyno, 35 km (22 mi) south-west of Kartuzy, and 62 km (39 mi) west of the regional capital Gda sk. For details of the history of the region, see History of Pomerania. Gmina Sul czyno is a rural gmina (administrative district) in Kartuzy County, Pomeranian Voivodeship, in northern Poland. Its seat is the village of Sul czyno, which lies approximately 31 kilometres (19 mi) west of Kartuzy and 59 km (37 mi) west of the regional capital Gda sk. The gmina covers an area of 131.31 square kilometres (50.7 sq mi), and as of 2006 its total population is 4,886.